These findings are extremely important for the understanding of cell division regulation, which is often disrupted in cancer cells. 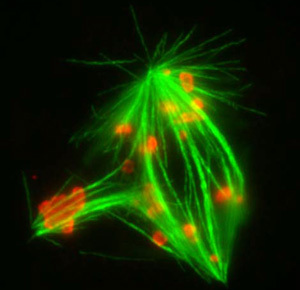 By Max Planck Institute for Molecular Genetics, Berlin, The rod-shaped filaments of the microtubules are responsible for dividing the chromosomes in a cell. They form a connection between the starting point in the chromosomes, the kinetochors, and the centrosome. The centrosome organizes the spindle-shaped arrangement of the microtubule filaments in the cell by means of gamma tubulin ring complexes. Until now it was assumed that control of even distribution of chromosomes was only monitored by the checkpoint kinases in the kinetochors. When microtubules are correctly attached to the kinetochors, these kinases then inform the cell that a precise distribution of chromosomes can be carried out. Scientists at the Max Planck Institute for Molecular Genetics in Berlin have now discovered that the checkpoint kinases are also associated with the gamma tubulin ring complex proteins. Accordingly, the researchers have proved that these checkpoint kinases also exist alongside the centrosome and perform their function there. This is a crucial new finding, since it shows that the correct organization of these filaments at both ends is important for correctly distributing the chromosomes during cell division. Another surprising finding is that these control mechanisms function independently of the integrity of the kinetochors or the centrosomes. This reveals that a cell has widely differing mechanisms for controlling cell division and monitors these directly at the level of protein complexes. These findings are extremely important for the understanding of cell division regulation, which is often disrupted in cancer cells. The checkpoint kinases in cancer cells are frequently modified or present in incorrect quantity ratios. In their next step, the researchers plan to carry out targeted analysis of the molecular reactions between the different regulatory proteins and then investigate how these interactions differ in healthy cells and cancer cells. Long term, this could lead to the development of new diagnostic or therapeutic strategies. The research work on the role and function of the checkpoint kinases was carried out in the context of the Ultrastructure Network (USN) and the Systematic Method Platform Protein (SMP Protein) project of the National Genome Research Network (NGFN2). The aim of the USN network is to clarify the function and structure of certain protein complexes, while the remit of the SMP Protein project is to investigate disease-related protein-protein interactions on a molecular basis. The project was supported by the Max Planck Society, the European Union, the Berliner Senatsverwaltung f�r Wissenschaft, Forschung und Kultur (Berlin Senate Administration for Science, Research and Culture) and by the NGFN (BMBF).